Just like all non-profits, we have a board of directors who lead us in developing vision and ensuring we have the finances in place to continue offering valuable programs. We could not do what we do without their guidance and dedication. Meet Kathryn Lemish, Vice Chair of FWCC’s Board of Directors. Kathryn grew up in Kendallville and how resides in Huntertown with her husband Dave and their two daughters, Nora and Amelia. 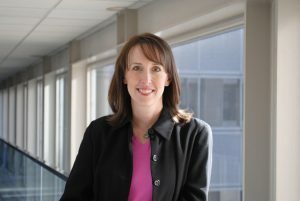 She is an Assistant Vice President at Lincoln Financial Group in Fort Wayne, where she has worked for 17 years. She earned a Bachelor of Arts in Music in 1998. Even though she doesn’t have a full-time job in music, she has continued to work with area marching bands and winter drumlines, both teaching and arranging the percussion music for fall marching band shows with her husband. 1- How long have you volunteered for FWCC? I’ve been helping at the FWCC since my daughter first joined in 2013 and have been on the Board since 2015. 2- What were you most surprised to learn about FWCC after getting involved? I was really amazed at the quality of the music education. I knew from early parent meetings and learning about the organization online that they emphasized music education but until I started observing rehearsals, I didn’t realize how robust the education was. I’m still amazed by what the kids learn. I have a degree in music and I know there were people in my college theory and ear training classes that couldn’t do what some of the students in the FWCC do. It’s amazing! 3- Why do you think FWCC is important to our community? There are so many reasons! Time after time, studies have shown that children who are involved in music do better in other core school subjects. Additionally, singing in a choir teaches kids to work together toward a common goal; when they’re on stage singing, they’re creating something beautiful with kids of different ages, interests, and backgrounds. They’re also building confidence by standing on a stage in front of thousands of people. These are great life skills! Plus, singing is fun and it’s a skill they can enjoy throughout their life! 4- What is your favorite FWCC memory? That’s tough! Being on tour with the Concert Choir this year was really fun! But it’s always wonderful to watch my daughter sing with the choir – whether it’s on stage at the Embassy with the Fort Wayne Philharmonic or in a pizza place in North Carolina while on tour. Seeing her grow and mature, not only as a singer but as a person, as well, has been wonderful.